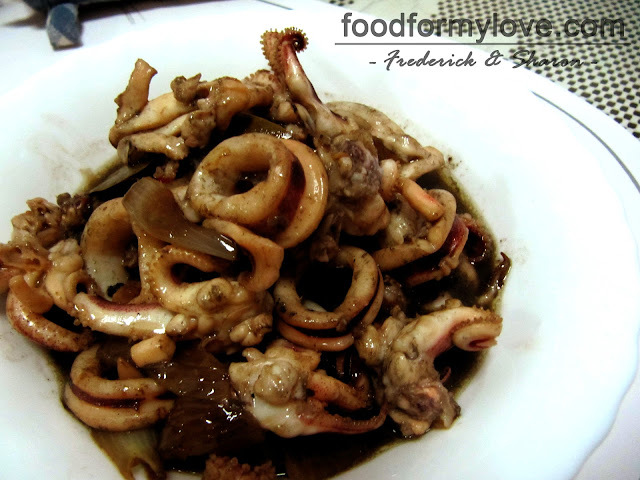 Frederick cooked adobong pusit for supper last night. He's feeling better already so he can eat non-soupy dish. 1. Heat oil in a pan. Sauté the garlic then onion in it. 2. Stir in the rest of the ingredients except for the squid. Let it simmer. 3. Add the squid and cook it until the squid turned in color. Makes 4 servings . Here’s the estimated Nutritional values per serving based on the ingredients used. Calories : 148 kcal Total Fat: 12.25 g.
Cholesterol : 25 mg. Saturated fat : 1.72 g.
Protein : 9.75 g Trans fat : 0 g.
Sodium : 466 g. Dietary fiber : 1.25 g.
Carbohydrate : 1.25 g. Sugar : 1.25 g.